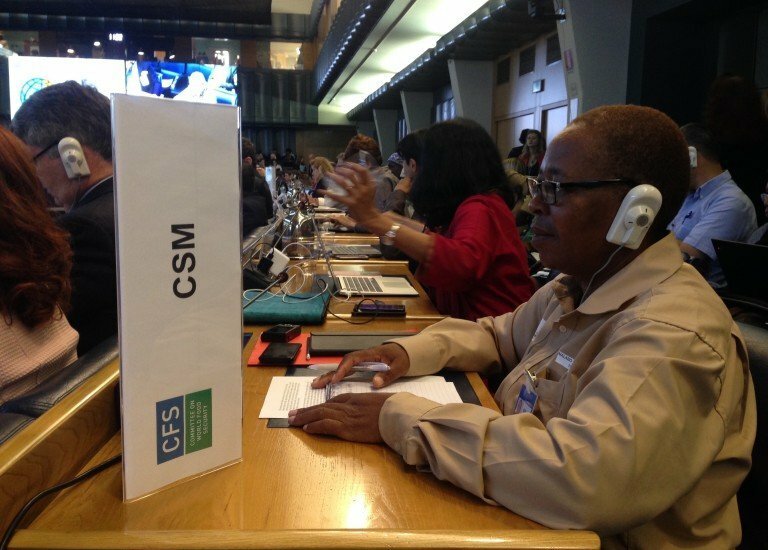 CSM welcomes the attention being given at World Food Day to the links between climate change, agriculture and food security. To be sure, we, small scale food providers, farmers, pastoralists, fishers, indigenous peoples, food and agricultural workers, youth and women live in the places where climate change is felt most acutely, in the most fragile ecosystems, and under the most difficult working conditions. We nurture and grow biodiversity in our fields, forests, waters, mountains and deserts, where the greatest biodiversity is often found. For centuries we have safeguarded precious and diverse seeds and animal breeds — through conservation, sustainable use, breeding, exchange and our intimate knowledge of how they perform in the changing contexts of our ecosystems. We practice agroecology: a vast body of knowledge, practices, and ways of knowing and working with our agro-ecosystems. Agroecology is our systems approach to climate adaptation and mitigation. The industrial food system, particularly industrial agriculture and livestock sectors, contributes more than one third of total global greenhouse gas emissions. Droughts and floods create food price volatility, which deepen hunger, malnutrition and vulnerability. In contrast, small-scale food producers and workers provide majority of the world’s food, with less fossil energy and waste, with more carbon sequestration capacity, on a quarter of the world’s farmland. We are alarmed that instead of recognizing and supporting the potential of agroecology and ending corporate control over food and agriculture, false solutions to climate change are being proposed that do not address its root causes, but instead promote practices and conditions that exacerbate climate change. These include climate smart agriculture, emissions trading and offset schemes, blue carbon, and various market mechanisms that are kicking people off the land, grabbing water and oceans, expanding monocultures, and financialising our food systems. We also raise cautions against solutions that involve technical fixes, or marginalize our knowledge and our control over our ecosystems, under the name of ‘climate smart agriculture’. Corporate mergers are also taking place in the name of better fighting climate change. If we want to build climate resilience, we must protect and respect our rights to territories, forests, water, seeds, knowledge and the rights of workers. At the same time we must stop the practices and policies that are destroying our ecosystems with industrial agriculture and aquaculture, monocultures, extractive industry and mega infrastructure projects. Madam chair — our territories, water, seeds, and labour are not commodities to be captured by corporations and traded in carbon and other markets, To echo the slogan of World Food Day 2016 — The climate is changing, and so should our food. But how? By supporting agroecology and those who practice it, and the rights of workers who produce food in the most challenging circumstances. Because we grow more than food — we grow climate resilience, and we cool the planet.